I think The Sun buried the lead. They're reporting that the Leafs are done with Cujo, which I assumed was pretty obvious. Curtis Joseph is 42 years old. Several paragraphs deep into the Sun article is this little bombshell. Burke has suggested that if Gustavsson, widely considered the best goaltender outside of the NHL, signs elsewhere, he will replenish the goaltending position via the draft or free agency, which begins July 1. It's expected that the Leafs won't retain restricted free agent Justin Pogge, one time the franchise's so-called goaltender of the future. In April, I wrote Killing the Culture of Entitlement Means Pogge Has To Go in which I called Burke's shot. In hindsight, that entry was so totally awesome and accurate, I'm going to reproduce it below. I'm as guilty as anyone. Justin Pogge was awesome during the 2006 World Junior Hockey Championship, and ever since we've been waiting for him to assume his role as Maple Leafs saviour. Here's the entry I wrote in January 2006 in which I opened with the following line. "I have seen the future of Toronto Maple Leafs hockey, and his name is Justin Pogge." I have a great relationship with the Marlies PR people, and when I told them I wanted to meet Justin Pogge and ask him some questions, they quickly made it happen. He was the only Marlie I wanted to meet. Who wouldn't want to meet the future of Toronto Maple Leafs hockey? I was there during the low points and the high points. It's been a roller coaster ride with peaks and valleys. When I learnt he was benched for the final playoff game of the season in Winnipeg, I responded with this tweet. Pogge didn't get the start tonight.... it's Munro starting for the Marlies in the Peg. Whoa, methinks the Pogge era has grinded to a halt. For the second season in a row, Greg Gilbert passed over Pogge at playoff time. Pogge's NHL record this season was abysmal. There's a reason we picked up Gerber... Pogge isn't anywhere close to being an NHL starting goaltender. I want to believe, I really do, and that's the problem. There's a culture of entitlement with this franchise that Ron Wilson and Brian Burke are working hard to destroy, and that means Pogge has to go. I hate that this has to happen, but it's for the best. It's time to get Jonas Gustavsson to compete with Vesa Toskala for the Leafs spot. James Reimer is ready to play with Adam Munro with the Marlies. The Justin Pogge era has indeed ground to a halt. 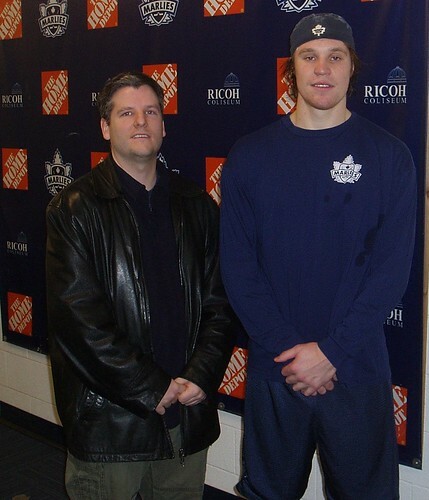 I'm going to miss rooting for Justin Pogge at Marlies games. My son is going to be devastated. I sincerely hope he catches on with another team and makes us rue the day we let him go. I hope he has a good backup plan. I don't think the NHL plan is going to work out for him. Too bad. He seems nice enough. I don't know that it's a done deal yet. This could just be part of Burke letting him know that he is not entitled to anything. He is an RFA so there is just a mandatory raise so he could be signed to a two-way deal and let him continue with the Marlies. Then again, with Gustavsson hopefully on his way maybe Reimer and Munro will take over the Marlies. Burke was calling the coast looking for Dan Cloutier's number? He never could fill the goalie void here, hopefully he does better for you! Pogge - Nice guys finish last. You knew he was finished when he hardly played during Marlie playoffs. Burke call shots there also. Can be used as trade bait on draft day. Gustavsson proably a done deal. Ray Emery to Philly today??? As Pension Plan Puppets says, he's a UFA, so he's no trade bait. Who wants to bet we draft the other Schenn on June 27? It would be kinda foolish to cut ties with your top prospect after one bad year. He's got way too much talent to just let him walk and he's still a spring chicken in goalie years. Sign him for another year and make him work for it. Andrew - I disagree, nice guys finish last because they aren't as good as the best players, which are usually a-holes. In the words of Billy Martin, if it didn't matter if you win or lose, they wouldn't keep score. Damn this "andrew"..maybe I need a new moniker....how does "Argie" sound? Andrew Get Your Apple Juice? Maybe I need a blog. Wait, that's your son in the picture? Reupping with Pogge as an RFA won't take much dough, and I see no purpose behind retaining the services of Munro with the Marlies. Pogge may yet develop into a decent backup/starter in Toronto, and I would drop Munro and promote Reimer to compete with Pogge for the AHL starting gig. It won't cost the Leafs much, and there's zero point to tossing the kid aside. The fact that they're seeking an NHL backup does NOT preclude bringing Pogge back to the Marlies. I also believe that the team has not given up on Justin Pogge. I want to make that very clear...Brian has said the following: 1) Toskala will start for the Leafs next season. 2) I want Gustavsson. 3) If I can't have Gustavsson, I want a great backup to challenge Toskala. 4) Cujo won't be back. That's it guys...That's it. Reporters and media have deduced that this means Burke is insinuating his indifference to Justin Pogge, that he no longer believes he has it in him. Well, actually, Brian has not said a single word about Justin Pogge. Contrarily, Burkie has actually (privately) brought up the example of none other than JS Giguere as a comparison to Pogge. Both are big, both were drafted and had high expectations. Giguere's first NHL season was 96-97. His numbers? 8GP, 1W, 4L, 3.65GAA, .881%. Between 1997 and 2000, Giguere played 21 NHL games. That's it. And he had mediocre numbers. Anaheim picked him up in 2000-2001 for a 2nd round pick and put him in the hands of Allaire and his confidence flourished. 2003 he's in the finals. 2006 conference finals. 2007 he wins a cup. The same goalie who was written off and left to play 21 games over three seasons...The difference? Confidence. Burke has a living, breathing example right in front of him that you can not write off a goaltender who was once great. If Pogge had never once been considered the best young goaltender in Canada, he would be outta here. But its in him. Somewhere. The Leafs aren't exactly overflowing with goaltending prospects...Why on earth would you let one of them go. My bet after reading of the Allaire signing: Before Brian Burke's contract is up in Toronto, Pogge will become the starter and take Toronto to at least the conference finals. Fans, you can doubt him all you want. Justin Pogge is your goaltender. And he is good. And he is about to become great. And because he will become great in Toronto, he will become a legend. You heard it here first. Matt, I hope you're right. I'd like to see Pogge work with Francois Allaire‎. I like Justin's attitude. He once said in an interview that nothing has ever come easy to him in his life...Everything he has ever accomplished has started with failure and challenges, to the point where he has learned to accept them on the road to success...And when they don't happen, he doesn't get too ahead of himself. He has the ability to let in 7 goals and think "Its okay, its part of the process and bound to happen. The earlier it does, the earlier I'll learn from it." He also has the ability to dominate a World Junior tournament with a GAA of 1.00 and think "Hey it was 7 games with a bunch of kids, you're no Patrick Roy yet..."
Would we have rather had Pogge's career turn in the direction of Jim Carey? Remember Carey? Vezina trophy in his 2nd NHL season...and then *thump*. Could not win a game. What about Andrew Raycroft? Calder winner...and then *thump*. Not every goalie that starts off great, ends great. Not every goalie that starts off poorly, ends poorly. How about Ed Belfour? First season: 23GP, 4W, 12L, 3.87GAA, .887. You tell me if you would have given up on him. No. Why? Because he had success before. NCAA and IHL, he was a goalie who won games. So was Justin Pogge, and its just a matter of bringing the winner out. I wonder if he would be as good as Reimer has been if he got a fair chance . There are players who can play hockey in the NHL if they get s fair chance . Thankfully Reimer got a shot at it , I love his attitude and his play . If pogge got a chsnce I'm sure he would do well , I wonder if the leafs will give there other Marlie goalies a chance next year , I really think they should , you never now with goalies , look at all the washed up goalies in the league , like giggy and Elliot and oops raycroft good example Joey Crawford a rookie steals Marty turco job in Chicago ! Wake up GM s in the league give a guy a fair chance ! !